Jake had been asking about an overnight Puckaway trip since our last quick ride up, so I surprised him today at school with a loaded truck ready to head west. We stopped at the Dollar General in Princeton on our way for snacks and supplies. I keep underestimating that store… They have tubes of silicone! I could have saved myself a trip to Berlin earlier this summer when I was hanging the door. Picked up a full-size kitchen trash can, some white spray paint, bleach cleaner, and Lysol. Jake picked out some Hot Wheels, orange soda, and snacks. After narrowly avoiding being sidelined by the Princeton Homecoming parade, we ended up at Puckaway around 3:30. Still unusually warm for this time of year, it hovered around 70 for most of the afternoon. As soon as we pulled in, I brought a cooler into my trailer to transfer some very precious cargo to the fridge. Four dozen pickled eggs, and a jar each of pickled mushrooms and asparagus now wait in the trailer for Puckaweekend. We opened up Jake’s new Hot Wheels and he started playing with them on the deck. I made a quick pass around the front of my trailer and the brickpile garden with the mower. The grass wasn’t very high, but I needed it cut before moving onto our first project for the afternoon. Jake kept after me about going to see the deer bones he found the last time he was up here, so I gathered them up in a pail and laid them out on the picnic table. He had his work gloves on and was really interested in seeing how they all fit together and what they were for. It’s a little macabre but also cool to see him get so into learning. I took the drawers out of the lower kitchen cabinet since I noticed the last time we were up that they still smelled like mouse piss despite repeated cleaning with bleach spray. Figured I could solve the issue the same way I did with the cabinet itself by sealing the wood with spray paint. Not sure if it was cheap spray paint, I was over-applying it, or both, but it took me two cans to spray the insides of the four drawers. In any case, it’ll be worth it to get rid of that last source of stink. I hooked one of the small yard trailers to the green ATV and loaded it up with the bags of mulch that were stacked by the brickpile. Those bags had been sitting there for five years. They were originally bound for Presque Isle but got detoured when Dad hit a deer on his way there. His truck got fixed in Oshkosh and I unloaded the bed while it waited at the body shop. Finally got the go-ahead to do something with long-forgotten mulch, so I spread it out around the front of my trailer between the two doors. Grass never grew well there, so it looks much better now. Jake was a great helper, picking up the empty mulch bags and stacking them back on the yard trailer. 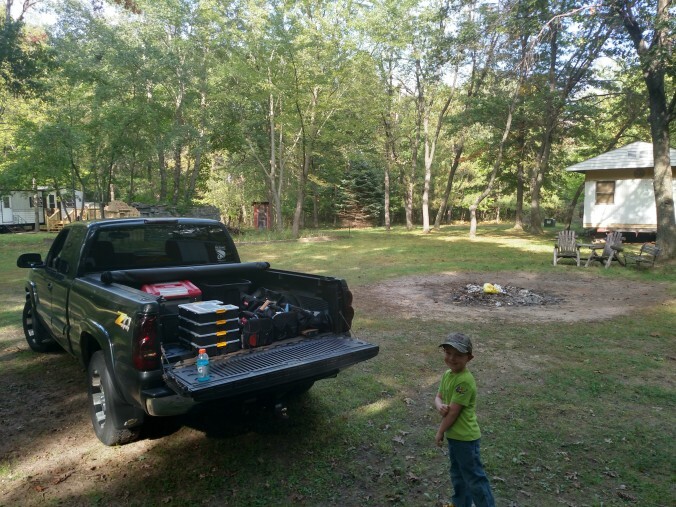 We parked the ATV and trailer and backed the truck up to the deck to tackle the next project. I mounted two PVC outlet boxes on the far side of the deck platform, drilling 7/8″ holes through two of the rail posts to route the conduit for them. One outlet-pair will provide power at all times while the other one will have its two outlets each controlled by their own switch inside the trailer. One will be for some deck accent lighting (my fancy way of saying “strings of Christmas lights”) and the other will be for the outhouse lights and fan. We took a break for dinner when our pizzas showed up. I had called in a delivery order from Pizza Factory. Jake loved his “all the meat” pizza with ham, bacon, pepperoni, ground beef, and sausage. I figured he’d be bored once I started the wiring project in earnest, but he was really interested in it and wanted to watch me. Getting the boxes and conduit in place was easy. The hard part was running the new wiring up to the switches. I pulled back the bottom of the wall panelling inside the trailer and drilled down through the wall frame and subfloor. I’m glad I remembered to bring my 18″ bit extension or this would have been impossible. I crawled under the trailer to route two lengths of Romex up through the hole. Once they were pulled in and up to the switch boxes, I wired the outside outlets and mounted them and their waterproof covers to the deck. I cut the power to my trailer and wired the new switches by the light of my flashlight. Put the wall back together and restored power. Everything works! I rewarded Jake’s patience with a night ride on the blue ATV. We didn’t see any animals, but the stars were really bright and he loves riding in his special back seat no matter what. After we parked the four-wheeler and closed up the pole barn, I noticed Jake was starting to fade. I put on Planes: Fire and Rescue for him while I cleaned up after the wiring job. He was asleep by 9:30, about 15 minutes into his movie. I carried him into the bedroom (no small feat with that narrow hallway) and tucked him in. I went back outside and strung up the deck lights to make sure I had enough to span all the railings. I like how it turned out and it’ll look even better once I secure the lights properly. 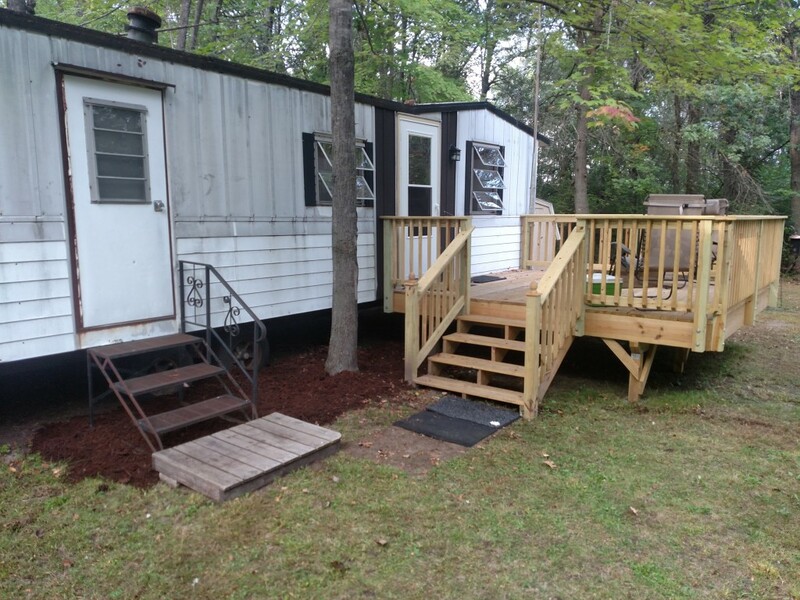 The yard lights on the side of the trailer, the outhouse lights, and the new deck lights can all be independently controlled. I’m looking forward to being able to leave the deck lights on and attracting far less moths and other bugs than the trailer lights always have. With everything buttoned up and put back together, I joined Jake around 11:00. The moon is almost bright enough to read by. Jake let me sleep much longer than I expected. He told me he had to pee around 7:00 and we were both up for the day after that. Jake wanted to check all of the new switches to make sure they still worked. Thankfully, they all passed his test. We got dressed, filled up the bird feeders, and headed to Aunt Judy’s around 8:00. For a moment, it seemed like we’d be stuck at a table, but two seats at the bar opened up just in time. 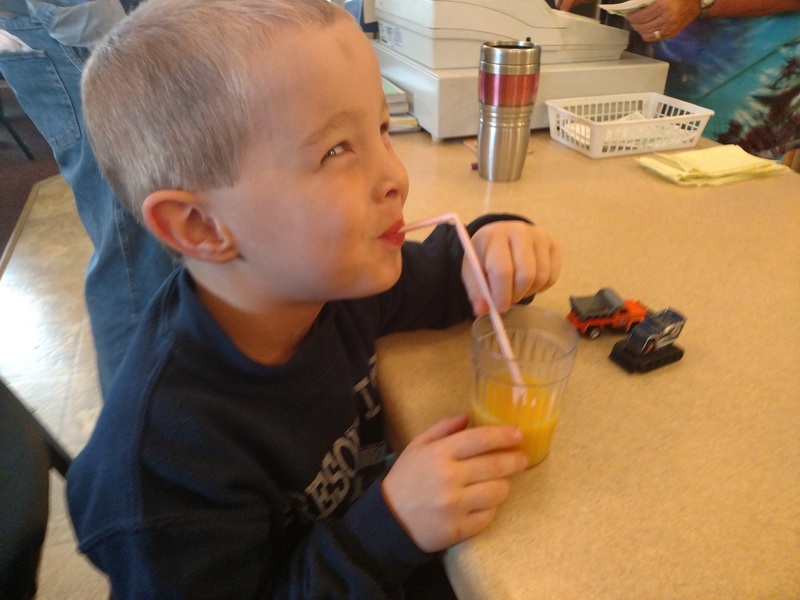 Jake had a strawberry Belgian waffle and ate a good 3/4 of it with his two glasses of orange juice. I had my usual. Aunt Judy herself sat next to us for a while and Jake charmed her and the waitresses with his stories of hard work at Puckaway. Once we came back from breakfast, I started a small pit fire to burn our garbage and grabbed a can of Great Stuff to seal up the holes left by the previous day’s electrical project and last month’s kitchen counter refit. Lyssa needed us back so she could make a noon hair appointment, so we were on our way shortly after 10:00.